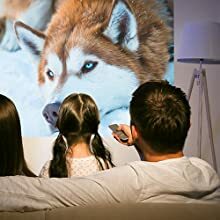 • Bright Color Projector: The bright mini projector adopts the latest 4.0'' LCD technology with an advanced LED source. 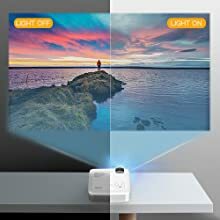 This 3500 lumens projector is 70% brighter than others. It provides you with a premium home cinema experience with the bigger screen and clearer image. • Best Viewing Experience: Supports 1080P full HD with 800*480p native resolution, with an aspect ratio of 16:9/4:3. Supports screen size from to 34’’ to 180’’. Best choice for your families gatherings and ideal for playing at home and backyard in a relatively dark environment. Enjoying the bigger screen, protecting your eyes from TV, laptop and smartphone. • Advanced Speakers and Fan: Dual built-in speakers, offers excellent loud sound quality without connecting an external speaker. Powerful cooling system cools the heat of the lamp efficiently, extending the bulb life to 45,000 hours, which means you can use it more than 10 years. Thoughtful details for better use. 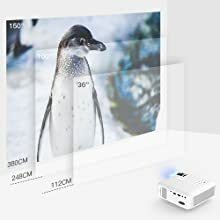 • Multiple Devices Connection: The compact mini projector is easy to set up and use with many ports, including HDMI, VGA, USB, Micro SD, AV interfaces. AV and HDMI cables included. It supports wide-range of connection with many devices, such as PC, Laptop, PS3/4, X-Box, TV Box, TV Stick. Compatible with MacBook, iPad, iPhone, other Smartphones(support MHL). • 100% Customer Service: Every APEMAN product includes a 30-day refund and exchange & 12-month warranty if any projector defects. Please don't hesitate to email us via support@apemans.com. We are pleased to offer you a satisfactory solution at any time. Why Choose Our APEMAN Projectors? 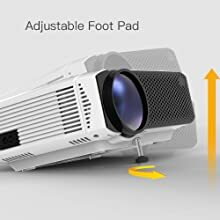 APEMAN LC350 Portable Mini Video Projector with 3500 lumens brightness, up to 45,000 hours of lamp life, supports 1080p Full HD multimedia video and multi-input connectivity to suit your diverse needs. 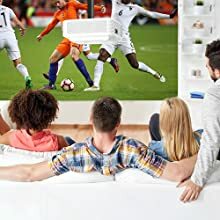 In addition, it offers a projection size ranging from 34" to 180" and can be adjusted to 4: 3/16: 9, which brings you a superior viewing experience. You can enjoy home theater with your family and friends by enjoying videos, football matches and video games. 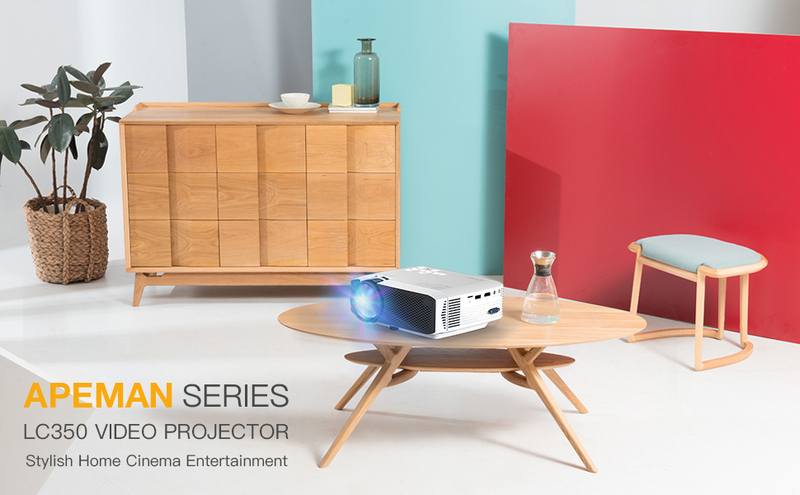 The APEMAN projector series will make your life more and more colorful and interesting! Enjoy Home Cinema with Your Family! APEMAN LC350 video projector with stylish design delivers a vivid image & powerful dual speakers which can meet most of our customers' needs. It is the best gift for your family and friends! Enjoying films, TV series, live sports and playing video games with your families and friends. Upgraded 4.0'' LCD display technology with LED light source softly protect your eyes from eyestrain. 3500 lumens +80% brightness better than 70% projectors, brings you superior home cinema experience. LC350 Projector can be mounted to your ceiling. Also compatible with an external tripod to meet your diverse needs. Built-in dual audio speakers provide the super loud and clear acoustic effect. Support wireless connectivity with Wificast / Dongle. Enjoy the leisure time with your family on weekends and holidays. APEMAN LC350 home theater projector brings you warm and pleasant parent-child time. The projection size varies from 34'' to 180''. the projection distance between 3ft and 12ft. Adjust the Keystone Correction to make the image rectangle. Adjust the Focus Wheel to make it clear. Free to adjust the height of the projector so as to present suitable viewing performance. Just rotate the screw cap slightly, comes out! To connect with Macbook, an external Mini DisplayPort to HDMI/VGA adapter is needed. APEMAN LC350 Projector is mainly used for home cinema and video games, NOT recommended for PPT, Word, Excel or business presentation. It will perform the best effect if the projector is under relatively dark room environment. For all home projectors, the screen edge is not as clear as the center. The USB port only supports USB flash drive, NOT support cord connection and data transfer. Choose "PCM" Digital Audio Output in your Blue-ray DVD player, NOT support AC-3 audio format and Dolby sound. You need a supporting video decoding device to play 4K video files (MKV and HEVC), Such as TV box, computer, iPad etc. 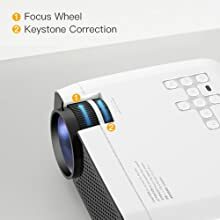 The light of this projector goes off suddenly and goes back on while using, which is caused by the self-protection mechanism, not quality problem. Q1: what about sound? is it Bluetooth/wifi? Bluetooth or wifi. If you have any other questions, please feel free to email us projectortechteam@gmail.com. Q2: Am I able to use a dongle on this projector? 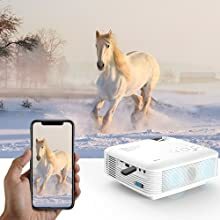 Q3: Can I connect phone x to this projector? 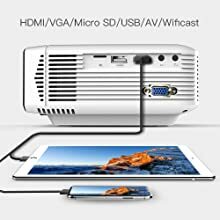 A: It needs an Apple Lightning to HDMI adapter from Apple store to connect it with this portable projector with iPhone X. If you have any other questions, please feel free to email us via projectortechteam@gmail.com. Q4: Does it come with HDMI cord? Or do I have to buy separate? A: Hi friend, thank you for your question. LC350 Projector equipped with an HDMI cable, so don’t need to buy one separately. If you have any other questions, please feel free to email us projectortechteam@gmail.com. Q5: Is this projector compatible with PlayStation 4? please feel free to email us via projectortechteam@gmail.com.